This book presents natural hazards and risk--one of the fastest-growing and most relevant fields of pure and applied research within geosciences and environmental engineering—from a multi-disciplinary perspective. It examines principles, concepts, and paradigms derived from diverse research studies, and explains operational terms, materials, tools, techniques, and methods used in practice. 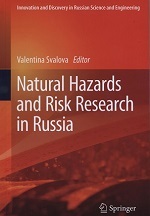 Collecting the expertise of more than 60 scientists and expert practitioners from across Russia, this authoritative volume is ideal for the diverse range of researchers and professionals concerned with the interaction of natural hazards and the built environment. Directs geologists, engineers, architects, planners, teachers, students, and others to authoritative sources.